Inky Fairy Designs: 10 Minutes or Less Card featured on CardMaker Blog! 10 Minutes or Less Card featured on CardMaker Blog! Hi everyone! I'm so excited to be joining the CardMaker Blog Team this year and my first post is live today. Here is a little sneak peek of the card I created with my assignment of 10 minutes or less!! 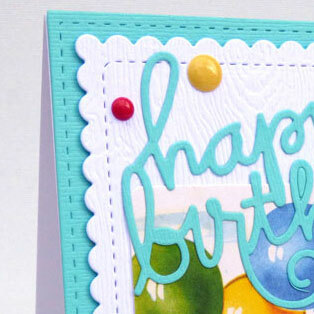 To see the complete card and full supply list be sure to hop on over to the CardMaker Blog today. Love the card. Like how the tail of the r twines around one of the balloons. Good use of buttons for balloons. I am not a 10-minute card maker. I start with an idea and change it several times (hopefully improving) before I am satisfied.